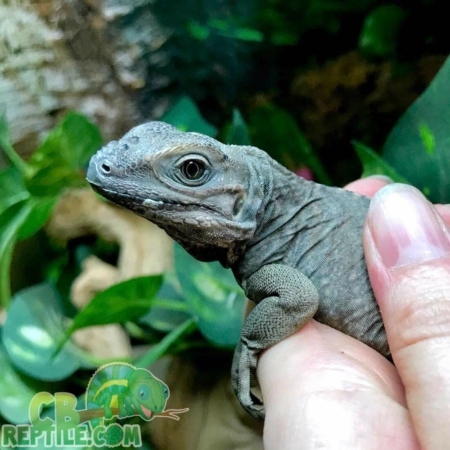 Rhinoceros iguana care sheet includes Rhino iguana diet, Rhino iguana habitat setup and care, Rhino iguana UV light requirements and more. 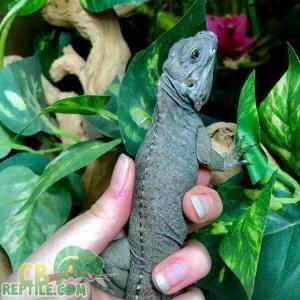 Before purchasing your new Rhino iguana for sale online, find a reputable rhinoceros iguana breeder that only works with captive bred rhino iguanas for sale. 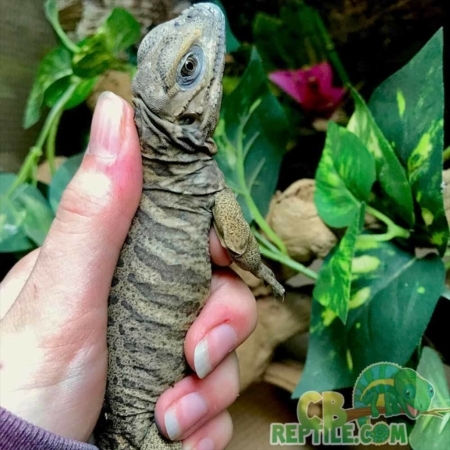 At CBReptile.com, we ONLY work with 100% captive bred reptiles for sale, so all of our baby rhino iguana for sale (baby rhinoceros iguana for sale) are 100% captive bred! Rhino Iguana Enclosure: With all the different enclosures available on the market today choosing an enclosure could become quite confusing. We would recommend a simple wooden vivarium with glass sliding front doors. Fitted with a heating system and lighting system as mentioned below they just seem to make the perfect habitat for a pet reptile. They look nice and can be ordered in a colour to match your household furniture. They hold the heat well, are easy to clean and durable. We would not recommend one of the many different glass enclosures on the market today as they are very expensive compared to the wooden equivalent and they do not hold the heat nearly as well. To house one fully grown Rhino Iguana you should have a minimum size of 8ft long x 4ft deep x 4ft high, young Rhino Iguanas can be kept in smaller enclosures but they will have to be upgraded as they grow. Rhinoceros iguana Temperature: These Iguanas should be maintained at 78-82 degrees with a basking spot of 90-95 degrees. You should create a heat gradient by putting your heat source only at one end of the enclosure, this will create a “hot” end and a “cool” end of the enclosure as this will give your animal a choice of temperatures in the enclosure so that he always feels comfortable. We always feel that the safest way is to use a thermostatically controlled heating system. The are many systems on the market today that are perfect for the job in hand. An overhead ceramic element or reptile radiator connected to a temp stat or a pulse stat is one way, or a coloured spot bulb connected to a dimming thermostat is equally as good. Both these systems will provide a very controllable heat source. There are other heaters out on the market such as AHS all in one heaters/thermostat that will also do a great job of heating the enclosure. Rhino Iguana Lighting: These Iguanas need UV lighting as they are diural (awake in the day). We would recommend using a 12% Arcadia Florescent UV Tube to give them the UV lighting they need. There are other options available on the market today but we wouyld recommend Arcadia. Rhinoceros iguana Humidity: These lizards should have humidity levels of 50-55%. This can be maintained by misting the enclosure once daily, devices such as waterfalls and foggers can also be used in the enclosure to help maintain the adequate humidity levels required. They also require a large water dish to allow them to soak in the water, this will also help to increase the humidity levels in the enclosure. 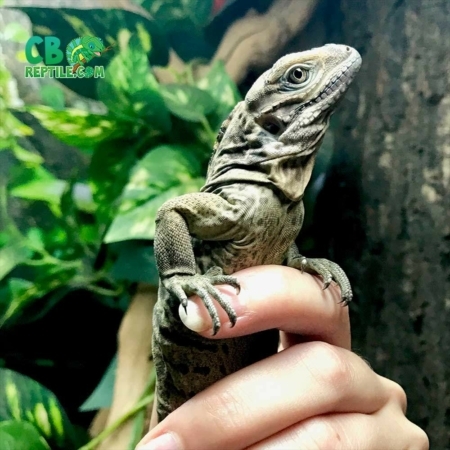 Rhino Iguanas for sale Substrate: Rhino Iguanas need humidity so substrates such as Kritters Crumble and Orchid Bark etc. Rhinoceros iguana habitat Furnishing: There are lots of furnishings available that are suitable for these lizards. A large water bowl is suitable so that your lizard is able to soak in the water if necessary. Lots of plants and bark should be placed in your enclosure so that your lizard can hide as bask as they like. 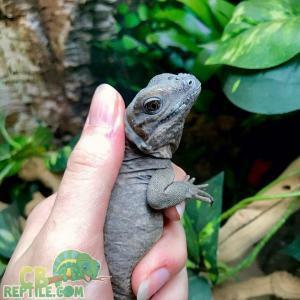 Selecting a Healthy Rhino iguana for sale: When selecting your new baby rhino iguana for sale, its important to find a reputable rhino iguana breeder, or rhino iguana breeders (rhinoceros iguana breeder) that works with captive bred rhino iguanas for sale only. Rhino Iguana Temperament: When young these Iguanas can be incredibly nervous and skittish. When handling, take care as these lizards have very sharp claws and they may attempt to bit you if your not careful. Regular handling and perseverance will help you to tame your lizard down as it grows and they can become fantastic pets. Rhinoceros Iguana shedding: These lizards will shed their skin throughout their lives. You will notice that the colours of your lizard will dull at the start of the shedding process and the skin will start to peel away in pieces. Humidity in the enclosure can be increased prior and during this period to aid this process and you will notice your lizard bathing more frequently. Rhino Iguana Handling: Handling is very important with these lizards, especially when they are young, they can be very nervous and skittish but regular handling will help them to calm down and get used to being handled. 10-15 minute handling periods are adequate, but be prepared to have to persevere with these lizards to help them calm down and get used to being handled. Rhino Iguana Diet: Rhinoceros Iguanas are vegetarians. A balanced diet should be made up mostly of dark green, calcium rich leafy greens such as collard greens, mustard greens, turnip greens, dandelion greens, and kale. Other vegetables and a small amount of fruit can comprise the remainder of the diet. Winter squash, summer squash, bell peppers, asparagus, and butternut squash are often good choices, as are green beans and soybeans. Grapes, strawberries, and mango are some recommended fruits. A calcium supplement is necessary, it should be lightly dusted on the Iguanas food every other feed, particularly when feeding fruits or low calcium vegetables such as squash. Rhino Iguanas Water: Fresh water should be provided for them daily. Rhinoceros Iguana Maintenance: The enclosure should be spot cleaned every day. Simply pick up any unwanted debris or feaces this will help prevent any bacteria build up in the enclosure. Every 4 – 6 weeks we would recommend that the enclosure is completely stripped out. Once you have removed your animal to a safe alternative warm temporary home, remove all furnishings and substrate, disinfect the enclosure totally making sure you get into all the corners. Disinfect all furnishing and rinse, replace substrate with new and then replace everything back into the enclosure and heat back to correct temperature before replacing your animal. Sexing a rhino Iguana: At around two years of age Males will start to show Hemipenal Bulges, Adult males are larger than females and can develop enormous jowls and larger cranial lobes. Breeding: Male Rhinoceros Iguanas, unlike other members of the genus Cyclura, reach sexual maturity at four to five years of age. Females become sexually mature at two to three years of age. Mating takes place at the beginning of, or just prior to, the first rainy season of the year (May to June) and lasts for two to three weeks. Females lay from 2 to 34 eggs, with an average clutch size of 17, within 40 days. Females guard their nests for several days after laying their eggs, and incubation lasts approximately 85 days. It has been noted that their eggs are among the largest lizard eggs produced in the world.